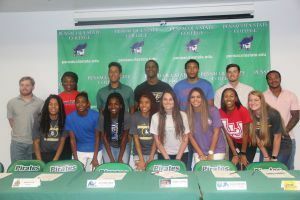 Fifteen Pensacola State College student-athletes struck some major deals Thursday, April 20, when they committed to Division I, Division II, Division III and NAIA colleges and universities. Men’s basketball players ─ Kani Coles and Harrison Curry – who signed letters of intent to the University of Central Florida and Louisiana Tech University, respectively. Coles, a forward and guard for the Pirates, averaged 8.3 points and 7 rebounds per game during the 2016-17 season. He was named to the FCSAA All-Panhandle Second Team. A sophomore, the 19-year-old is from Baltimore, Maryland. Curry, a guard and power forward, averaged 14.5 points and 6.3 rebounds per game. He was named to the FCSAA All-Panhandle First Team. A sophomore, the 21-year-old is from Ann Arbor, Michigan. Women’s basketball players – Daijah Brown, Xena Dove, Xana Dove, Autumn Jones and Losmie Lutaya – who signed with Arkansas Fort-Smith University, Johnson C. Smith University, the State University of New York at Buffalo and Southeast Missouri State University, respectively. Brown, a guard, averaged 9 points and 6 rebounds per game. The 19-year-old sophomore is from West Palm Beach. Xena Dove, a guard, averaged 3 points per game and shot 27 percent behind the arc. She is a sophomore. Xana Dove, also a guard, averaged 11 points and 7 rebounds per game, and shot 42 percent behind the arc. She was named a FCSAA All-Panhandle Conference Media Honorable Mention and to All-Panhandle Conference Media Freshman Team. She was a red-shirt freshman this past season. The 19-year-old twins are from West Palm Beach and will play at Johnson C. Smith University. Jones, a guard, averaged 10 points and 4 rebounds per game. She also made the President’s List for Fall 2016. The 20-year-old sophomore is from Indianapolis. Lutaya, a forward, averaged 4 points and 4 rebounds per game. The 21-year-old sophomore is from Kinshasa, Democratic Republic of Congo. Volleyball players – Sina Faulk, Kaitlin Grote, Milea Ray and Iyaria Walker – who signed to the University of North Alabama, the University of Mount Olive, Birmingham-Southern College and Lamar University, respectively. Faulk, an outside hitter, played in 70 sets and 29 matches ─ recording 140 kills and 130 digs. The 20-year-old sophomore is from Pensacola and a Catholic High graduate. Grote, a setter, played in 122 sets and 56 matches recording 899 assists. The 19-year-old sophomore is from Coral Springs, Florida. Ray, an outside hitter, played in 79 sets and 28 matches recording 137 kills and 117 digs. The 19-year-old freshman is from Alabaster, Alabama. Walker, a middle hitter, signed with Lamar University in November. She played in 86 sets and 32 matches recording 291 kills and 136 blocks. The 20-year-old was named to the FCSAA All-Panhandle First Team. A sophomore, she is from Houston, Texas. 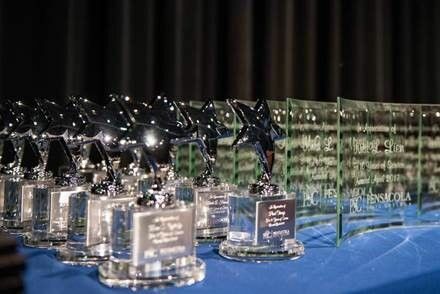 The college’s Volleyball Team were the 2016 All-Panhandle Champions with a 25-7 record, and Coach Chris Laird was selected Coach of the Year. Baseball players ─ Drake Cabe, Kaven Brown, Willie Carter and Onassis Matos – who signed with the University of New Orleans, Eastern Kentucky University and Georgia Gwinnett College, respectively. Cabe, an outfielder, is from Greenville, Alabama. He is a sophomore. Brown, a right-handed pitcher is from Paris, Kentucky. He is a sophomore. Carter, an outfielder, is from Fort White, Florida, and Matos, a catcher/utility player, is from Orlando. The sophomores will both play at Georgia Gwinnett College.